The Honor Roll of Donors. Drew loves a challenge. Launch an ambitious new undergraduate education platform and reduce tuition by 20 percent? Done and done. Our supporters—alumni, friends, parents and community members—are just as bold, generously, consistently and strategically investing in Drew, for both current and future students. Not only did our donors rally around the recent $5.3-million Gilbert Challenge (a seven-month sprint! ), they provided an impressive $1.65 million to our Annual Fund, an increase of 37 percent over the prior year. Dollars invested in the Annual Fund provide for everything that makes Drew, Drew, including new, innovative academic programming such as Launch. 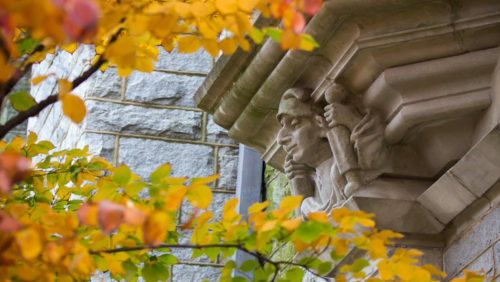 Additionally, this investment pays off across the university—in vital curriculum transformation and the largest class in more than a decade at the Theological School; in relevant new Master of Education and Master in Finance programs at the Caspersen School of Graduate Studies; and in a bold new College of Liberal Arts education that syncs career development with rigorous academics and powerful community. What’s more, the Class of ’22 is the CLA’s largest since 2011. This class boasts significantly higher SAT scores—on average 42 points higher—than the class average four years ago. And as a result of Drew’s lower tuition, a higher percentage of student financial aid comes from fundraising efforts—giving your dollars a proportionally greater impact on students’ bottom lines. We are never more grateful than when Drew sets off on bold new trajectories—and our donors respond with the unwavering support and unstinting generosity that propel us even higher. We thank you all. Annual Fund gifts provide a strong and flexible foundation and are set to work immediately serving the most important needs for our students and our future. Donors reflected in this report made gifts that were received during our last fiscal year (July 1, 2017 to June 30, 2018). Mr. Kenneth G. Hydock, Esq. Mr. James F. Titus, Sr.
Mr. Lawrence E. Horner, Jr.
Dr. H. Leedom Lefferts, Jr.
Dr. Prenard R. Mickens, D.D.S. Mr. Nelson S. Schaenen, Jr.
Donors reflected in this report made gifts prior to June 30, 2018, the close of our most recent fiscal year. F. M. Kirby Foundation, Inc.
Margaret and Marshall Bartlett Family Foundation, Inc.
Marino, Tortorella & Boyle, P.C. The Page Hill Foundation, Inc.
Mrs. Nancy S. Schaenen and Mr. Nelson S. Schaenen, Jr.
and enhance Drew’s financial development and allow the University to plan with confidence for the future. Donors reflected in this report made commitments prior to June 30, 2018 the close of our most recent fiscal year. most loyal supporters for five or more years. Ms. Melissa Fuest Alexo C’02 and Dr. Kenneth Alexo, Jr. Volunteers listed in this report served during our past fiscal year (July 1, 2017 through June 30, 2018). For current rosters, visit drew.edu/connections. Drew University endeavors to record the names of donors and volunteers accurately and completely. If we have inadvertently omitted or misstated your name, please accept our sincere apologies and let us know by contacting Julie Andreola at 973-408-3447 or stewardship@drew.edu.